I have tried South Indian style Chilli idli, Idli fry, Kaima idli even idli upma using left over idli.But Idli Manchurian is the one I wanted to make for long time.Yesterday I cooked some extra idlis just to make this manchurian.I made it for my daughter in the evening after she came back from the school.She loved it to the core and showed a big thumbs up .Generally kids love any deep fried snacks.I don’t have to say about the taste of fried idlis.So this recipe would be a sure hit among the kids and adults as well.This recipe is a combo of Indian & Chinese Manchurian recipes.While I was clicking the pictures,I couldn’t resist my temptation to grab some from the plate. It was so flavorful! 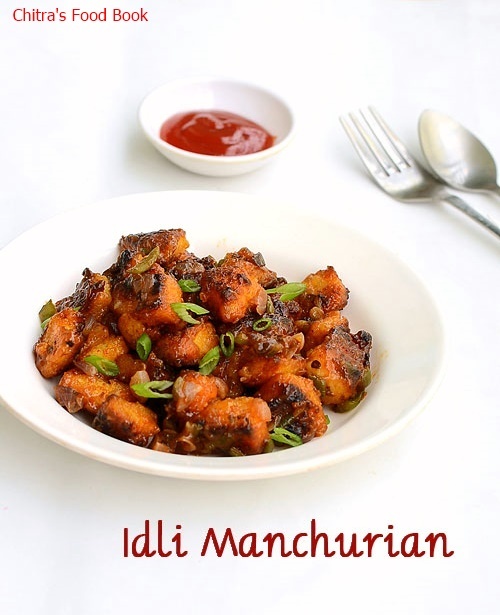 Do try this idli manchurian recipe for your kids as evening snack.I am sure you won’t even get a single piece to taste .Ok,Lets see how to make fried Idli Manchurian recipe with stepwise pictures. 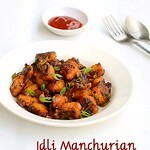 How to make Idli manchurian - Fried Chilli Idli Recipe. 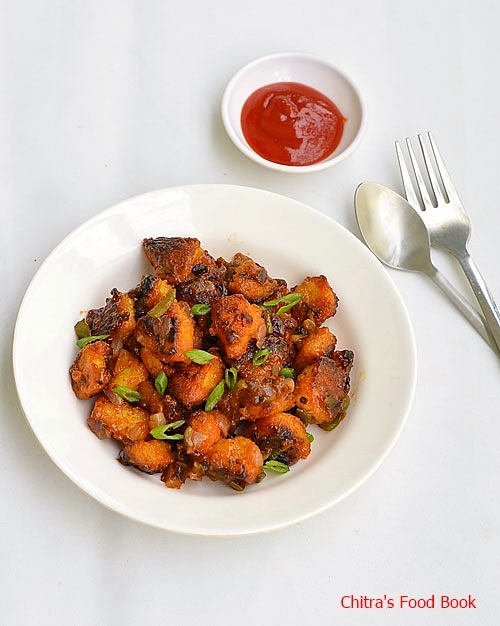 Cut the left over idlis into big cubes.To this mix maida,corn flour,salt,g&g paste,red chilli powder and mix well.Sprinkle some water to coat the idlis with batter.Mix it carefully,do not break the idlis.Let it marinate for sometime. OR follow this alternate method.ie Make a thick batter using maida,corn flour and spice powders and dip the idli pieces,deep fry in oil immediately. Heat oil in a pan and arrange the idli pieces to shallow fry. Roast it well in medium flame for 3-4 minutes.Flip the idli pieces and roast the other side as well.Do not cook in very high flame.Idli pieces may burn.Remove the pieces to a tissue paper.Drain the excess oil. In the same pan,add little more oil.Saute the finely chopped onion,garlic,ginger,spring onions and capsicum.Mix well.Add some salt,tomato sauce,soya sauce and green chilli sauce.Mix well and add red chilli powder,pepper powder.Mix well. Dilute corn flour in water and add this to the mixture.Let it boil for sometime and thicken. Add the idli pieces at the end.Toss it well and switch off the flame.Garnish with chopped spring onions.Serve hot with ketchup! Enjoy ! You can deep fry the idli pieces instead of shallow frying.I felt shallow frying patiently gives great results than deep frying.Deep fried idlis absorb more oil.Calorie conscious people can go for baking option. You can also add the idli pieces as such instead of frying them. Adjust the quantity of chilli powder,pepper powder and green chilli sauce as per your taste buds. 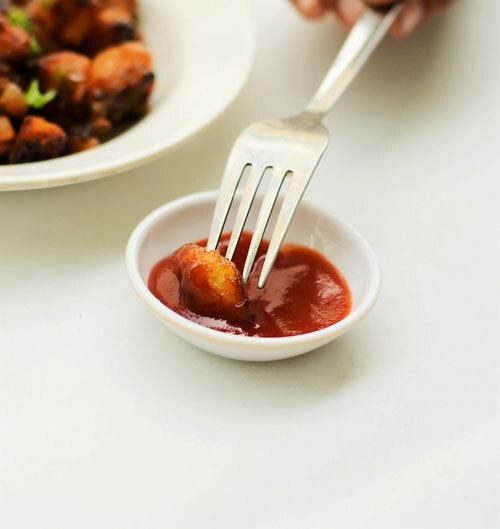 Enjoy hot idli manchurian with tomato sauce.Tastes yum ! Yes,u can skip and add rice flour. Looks awesome. Can u please say about the baking version too.. Will it change the taste?